The small business inventory software in Singapore is used to manage stock and keep track of the inventory for firms that do not require a large scale and expensive systems. The software has proper account of the inventory and contains all the important details relating to the asset management purpose. In essence, it has a computerized register to keep record of stock going out, stock coming in, track stock remaining and help for their easy managing as regards stock taking and others. The small inventory software works according to each business’s specification, whether the company is in Singapore, Malaysia or other countries. For instance, the MYOB is the accounting software which has inventory tracking feature that will organize the inventory in their database based on categories with all the details documented, restore and get them ready for sale to customers whenever needed. It provides comprehensive software technology solutions that is worth exploring for companies. Regulating the inventory levels is a critical factor in many product based businesses. In order to avoid overstock, product shortage and loss of customers; the software will work to optimize the process of ordering, keeping and tracking the goods. Depending on the area it is used, the software will help its users to know the stock on hand, control various raw materials as well as stocked items, sort the same and different products, document activities in progress and indicate finished products. Despite the variation in product details for different industries, a fully functional inventory management software has the capability of tracking each sales order, recently purchased products, delivered products and adjusts the product quantity. Alert the operator when products are to be re-ordered to avoid stock running out of the current usage rate. Advanced features include the ability to pre-set to automatically re-order a product when it reaches a certain quality (re-order level). Inbuilt barcode to rapidly and efficiently scan products that are received, sold and/or transferred. Business owners can download or view the various reports available for their business decision and client management making purpose. Evidently, inventory control is amongst the several challenges small firm owners face. Recently, various inventory management software are being used to circumvent these stock control problems in a number of ways. One-time investment – using an off-the-shelf inventory software, the small company only needs to pay a one-time fee to purchase the package without incurring monthly subscription costs. Help the business owners to save cost – many business owners have limited capital. So, it’s not advisable to stock inventories that will tie up funds. The inventory software helps to do these checks and balances to avoid overstock or shortage. Precious Time Saved – the inventory management tasks will be done more efficiently as the software performs all tasks in a fraction of time it will take for the work to be done by hand. This free time saved can be channeled to concentrate on main core business functions. i) One popular accounting and inventory software option in Singapore is QuickBooks Online, with affordable monthly fee. It is easy to use and the mobile app version allows you to manage your inventory level anytime and anywhere, saving you time. The secure backup means you do not need to do manual backup, making this a cost effective solution for you. In addition, there is no need for you to pay additional fee for updates or upgrades, as it is already included in the monthly fee. ii) The MYOB software family starts from the entry level Business Basics to the most feature-packed Premier (for Windows) and Account Edge (for Mac). The software is described as the best Australian accounting software for small businesses. It is also an accounting software for small business in Singapore. Many enterprises in Singapore have been using the trusted MYOB for years. The accounting software in Singapore features are known to offer a fast and easy way to manage the cashflow together with other time saving features to carry out daily transaction bookkeeping efficiently. 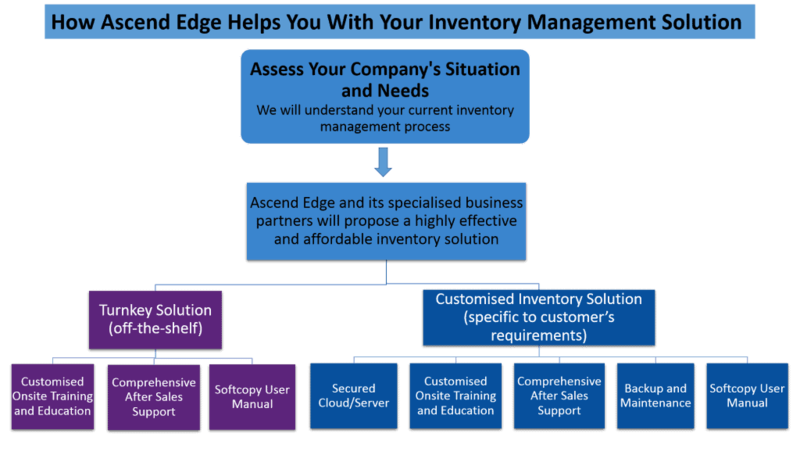 The features make it very useful for businesses with inventory in multiple locations and once well integrated, achieves great result with the accounting and other inventory management processes. MYOB Premier Plus offers Powerful Inventory Features. The software caters to Multi Currency-Transactions, Multi-Users, Time-Based & Tracking and Payroll. If you have have business requirements which cannot be addressed via the out of the box software, we do provide customised software, providing solutions specially to address your business needs. We will have a non obligatory meetup session, to understand your company’s needs and requirements. We will draft out a list of recommended solutions after the meeting for your review and consideration.